Form release and description: 40% alcohol solution 100 ml. Homogeneous transparent liquid of light brown color with a tint to greenish, with a slight specific odor. It is allowed to form a small amount of sludge at the bottom of the vial. The bottles are packed in cardboard boxes. 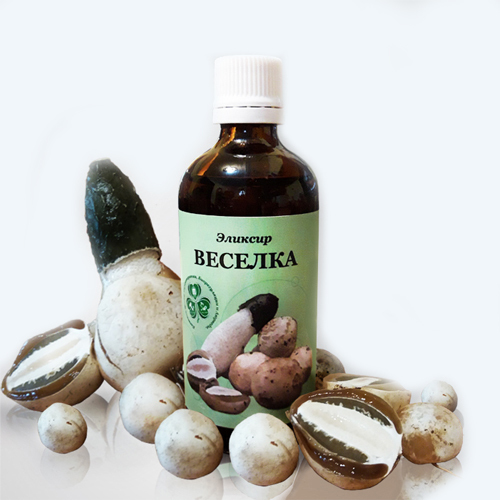 Tincture Veselka mushroom (Phallus impudicus), obtained from the fungus in the egg stage. It is processed by a special energy field, which allows you to preserve and repeatedly enhance the unique healing properties of Veselka tincture. The elixir contains polysaccharides, a complex of peptides, hydrogen sulfide, aldehyde, melanins, vitamins of group B, micro- and macronutrients, unsaturated fatty acids. Also in the elixir there are steroid compounds, flavonoids, saponins, amino acids, alkaloids, water-soluble proteins, coumarins, trace elements: Ag, Ca, Fe, K, Na, Mn, Zn, Ba. Phytoncides in high concentration. They are able to fight many known pathogenic bacteria and viruses, especially viruses of hepatitis, herpes, flu. - Stimulants for the production of perforin and lymphocytes - polysaccharides. They are the main components of the human immune system and are able to fight cancer cells. Thanks to the active ingredients of the fungus, when injected into the human body, the perforins are activated, they counteract the malignant formations, allow the patient to feel better. During chemotherapy, mushrooms can help reduce nausea, i.e., they can significantly improve a person’s condition. Helps with allergic diseases, being a natural antihistamine. Another surprising property of the fungus of the fungus is the ability to significantly increase immunity and lower sensitivity to the causative agents of certain diseases and various external stimuli. This allows you to call a fungus mushroom one of the main folk remedies for developing a protective reaction of the body’s immune system, that is, for effectively fighting AIDS, viral hepatitis. Restores the body after a stroke, heart attack, etc. Helps in the treatment of thrombophlebitis, varicose veins; purulent wounds; stomach ulcers and intestinal diseases; asthma attacks; tuberculosis; atherosclerosis; lymph diseases; joint pains; gout; blood disorders; sexual dysfunction in men. Take internally according to the scheme. Admission 21 day, 10 days break. MANDATORY: the use of pulmonary herbs. Individual intolerance. Since Veselka stimulates the immune system, its use in persons suffering from collagenosis (for example, systemic lupus erythematosus) is not recommended, since exacerbation can be provoked. Side effects: Not identified. Use with caution when prone to low blood pressure. Storage conditions: Store in a dry place protected from light and inaccessible to children at a temperature from 0 to 25C and relative humidity of air no more than 75%.